Last year, astronomers announced the existence of an unknown planet in our solar system. However, this hypothesis was subsequently called into question as biases in the observational data were detected. Now, Spanish astronomers have used a novel technique to analyse the orbits of the so-called extreme trans-Neptunian objects and, once again, they report that there is something perturbing them—a planet located at a distance between 300 to 400 times the Earth-sun distance. At the beginning of 2016, researchers from the California Institute of Technology (Caltech, USA) announced that they had evidence of the existence of this object, located at an average distance of 700 AU and with a mass 10 times that of the Earth. Their calculations were motivated by the peculiar distribution of the orbits found for the trans-Neptunian objects (TNO) in the Kuiper belt, which suggested the presence of a Planet Nine within the solar system. However, scientists from the Canadian-French-Hawaiian project OSSOS detected biases in their own observations of the orbits of the TNOs, which had been systematically directed towards the same regions of the sky, and considered that other groups, including the Caltech group, may be experiencing the same issues. According to these scientists, it is not necessary to propose the existence of a massive perturber to explain these observations, as they are compatible with a random distribution of orbits. Now, however, two astronomers from the Complutense University of Madrid have applied a new technique less exposed to observational bias to study the so-called "extreme trans-Neptunian objects" (ETNOs)—located at average distances greater than 150 AU, and which never cross Neptune's orbit. For the first time, the distances from their nodes to the sun have been analysed, and the results, published in the journal MNRAS, once again indicate a planet beyond Pluto. The nodes are the two points at which the orbit of an ETNO, or any other celestial body, crosses the plane of the solar system. These are the precise points where the probability of interacting with other objects is the highest, and therefore, at these points, the ETNOs may experience a drastic change in their orbits or even a collision. "If there is nothing to perturb them, the nodes of these extreme trans-Neptunian objects should be uniformly distributed, as there is nothing for them to avoid, but if there are one or more perturbers, two situations may arise," explains Carlos de la Fuente Marcos, one of the authors, to SINC. "One possibility is that the ETNOs are stable, and in this case, they would tend to have their nodes away from the path of possible perturbers. But if they are unstable, they would behave as the comets that interact with Jupiter do, tending to have one of the nodes close to the orbit of the hypothetical perturber." Using calculations and data mining, the Spanish astronomers have found that the nodes of the 28 ETNOs analysed (and the 24 extreme Centaurs with average distances from the sun of more than 150 AU) are clustered in certain ranges of distances from the sun; furthermore, they have found a correlation where none should exist between the positions of the nodes and the inclination, one of the parameters which defines the orientation of the orbits of these icy objects in space. "Assuming that the ETNOs are dynamically similar to the comets that interact with Jupiter, we interpret these results as signs of the presence of a planet that is actively interacting with them in a range of distances from 300 to 400 AU," says De la Fuente Marcos. "We believe that what we are seeing here cannot be attributed to the presence of observational bias." Until now, studies that challenged the existence of Planet Nine using the data available for these trans-Neptunian objects argued that there had been systematic errors linked to the orientations of the orbits (defined by three angles) due to the way the observations had been made. Nevertheless, the nodal distances mainly depend on the size and shape of the orbit, parameters which are relatively free of observational bias. "It is the first time that the nodes have been used to try to understand the dynamics of the ETNOs", De la Fuente Marcos says, adding that discovering more ETNOs (at the moment, only 28 are known) would permit the proposed scenario to be confirmed and subsequently constrain the orbit of the unknown planet via the analysis of the distribution of the nodes. The authors note that their study supports the existence of a planetary object within the range of parameters considered both in the Planet Nine hypothesis of Mike Brown and Konstantin Batygin from Caltech, and in the original one proposed in 2014 by Scott Sheppard from the Carnegie Institute and Chadwick Trujillo from the Northern Arizona University; it also corresponds with their own earlier studies, which suggested that there is more than one unknown planet in our solar system. Is there also a Planet Ten? "Given the current definition of a planet, this other mysterious object may not be a true planet, even if it has a size similar to that of the Earth, as it could be surrounded by huge asteroids or dwarf planets," explains the Spanish astronomer. "In any case, we are convinced that Volk and Malhotra's work has found solid evidence of the presence of a massive body beyond the so-called Kuiper Cliff, the furthest point of the trans-Neptunian belt, at some 50 AU from the sun, and we hope to be able to present soon a new work which also supports its existence." Ok, so the arrangement of ETNOs does look a little odd. Assuming arguendo these researchers are correct and something perturbed the ETNOs being considered, where is their Planet Nine? Mike Brown previously said he expected Planet Nine to be found by the spring of 2018 and most of that time has already lapsed. 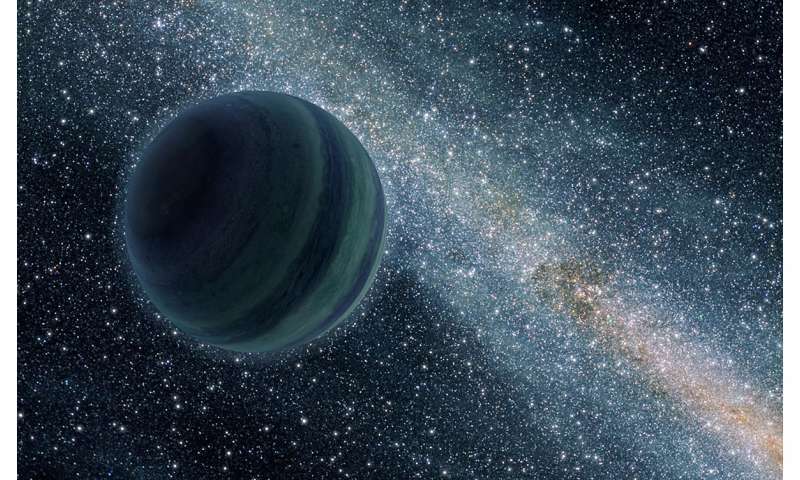 The continued failure to find Planet Nine suggests the perturber may have been a passing star, brown dwarf or rogue planet. Another possibility is that Planet Nine did exist, but was subsequently relocated or ejected by a passing star. The fact that Scholz's star with a companion brown dwarf is thought to have passed ~0.8 ly from the solar system only 70,000 years ago is a huge hint we do not have a complete picture of the history of the outer solar system, nor could we at this point. The PAN-STARRS survey has excluded anything brighter than roughly Mag 22.5. Given its proposed elliptical orbit, it's most likely near aphelion in which case, it could be as dim visually as Mag 25 which is pushing the limit of all but the best ground telescopes. We'd need an all sky survey (particularly in the infrared) with something as good as the Keck telescope, or use a space telescope, but there are time constraints on what projects to use these telescopes on. I don't see NASA lending the Webb telescope out to spend months searching for a predicted planet, when its main purpose is to hunt terrestrial exoplanets. It is frustrating that the WISE survey's sensitivity limit for a Neptune-size planet was 700 AU, which may have JUST missed it. In 2002 we detected a half Jupiter mass body in a 4969 year solar orbit, its semi major axis is about 291.2 AU. This is close to the 300 to 400 AU the Spanish astronomers predict. Our body ranges from 134.8 to 447.6 AU and has an orbital inclination of 48.44 degrees, close to one of the two values predicted for planet Nine (18 or 48 degrees). We called it Vulcan in 2002. Vulcan generates comet swarms in 3:2 resonate orbits. Thus a Resonate Interval is two Vulcan Orbital revolutions or about 9938 years. Finding weather changes that happen one Resonate Interval apart gives us a way to verify Vulcan's orbital period. The negative result from the,PAN STARRS survey cannot be used to exclude candidate objects. Absence of evidence is not evidence of absence, especially for astronomical objects. Pluto,was 'missed' on the 1919 plates.